Can you believe it's been 5 YEARS since Monkish opened it's doors?! With all the new beers, new equipment, and new faces, we are so grateful to those that have been with us since day one, and those that have joined us in the last year on our IPA quest. As a thank you to everyone who has supported us, we are going to release a special fruited bottle to celebrate. We will also be offering a great curated draft list and special edition glassware! In keeping with tradition, we will also discount our pours as an extra thanks, so all full-pours will be $1 off normal price! One of our true passions as a brewery is coaxing our barrels to help produce incredible farmhouse ales and see results like the bottles and draft we have been able to share with you. Monkey & Toad is the start of a series we will have for each anniversary in the coming years. This year's offering is a tart, oak-fermented farmhouse ale with peaches and nectarines from Masumoto Family Farms. ABV 5% 750mL cork & cage champagne-style bottle. Monkey & Toad will be sold for $13 per bottle at Bar 2 in front of the cold box. It will be limited to 2 bottles per person, as we only have about 400 bottles. And for all of you dying to know what the list will be, we will release the info next week in the days leading up to big day! No children or babies be brought to the brewery. This will be a 21 and over ONLY day. We will have security to enforce this rule. No pets (behaved or on a leash or otherwise) will be allowed. No growlers will be filled. No in's and out's. We will have security to enforce this rule and a strict limit to the number of people inside the tasting room. No bottle sharing or outside alcohol. Any seen will be taken and thrown out. The parking lot will open at 9am. There will be no lining up until then. We will have security enforcing this. We will have multiple beer stations, making use of our kegerator where the cans are normally sold. We will also have a separate merchandise station to purchase bottles, glassware, shirts, hats, hoodies, mugs, etc. and pick up Juteux bottles. Only limited seating will be available inside the tasting room. We will be removing seats in order to make room for more people. Bottle pick ups will still be available at the merch station (Bar 2) in the tasting room, since the last day to pick up Juteux is Sunday 3/12. We MAY create sessions to move people through the tasting room quicker if the line stays too long. We will use wristbands to assign groups. There WILL be day-of Twitter updates for the latest info! Lastly, Felice Catering will have our favorite pizzas and wings available for purchase! Can't wait to see you all at the tasting room next weekend! Our in-house canning line has arrived! In an effort to have more control over the quality and consistency of our canned beer, we have purchased our very own canning line and we are installing it this week! For all past releases, we have used a mobile canning company who comes to the brewery and packages our beer in cans for us. They have done a great job, but there are some challenges that we hope this installation will help us to overcome. We believe the canning line will give us even better control over quality assurance, along with being able to schedule canning days and release days more frequently. It also relieves us of having to schedule months in advance the packaging days with the mobile canning company. Now we are able to package beers in cans immediately when they are ready. This also brings us to a point of releasing beers during the week and not just on Saturdays. Does this mean you can make more beer? Short answer: Sort of. We are still a small brewery. For the most part, we like being a small brewery and the connection we have with every batch of beer, and our customers. We still have a small number of fermentation and packaging tanks as before (having added a new fermenter recently), hence the small amount of cans for releases. We are striving to be able to make more beer, and we should be able to run a better schedule with the line here! When will be the next can release? 1. Parking – Please be mindful as we have neighboring businesses that will be open during weekday afternoons and evenings. The parking lot will have limited spots available to our patrons, please pay attention to the cones and/or park on the streets surrounding the brewery. 2. Lines – We would like to minimize long lines during can release days so we will be experimenting with different ways of keeping them controlled. 3. Tasting Room Hours – We will still be opening at 4pm, but plan to stay open until 10pm if the cans are not sold out by 9pm. If cans are still available, we will sell to everyone in line by 10pm, no later. We want to allow as many people to buy on the day of release as possible. 4. Live Updates – We’ll have updates for these releases live on Twitter, including at start selling time, mid release check in, and sold out time. 5. Limits – These are set per person, per day. Thank you all, again, for the support and excitement surrounding our cans releases! We are so grateful for all of you and love you! We are canceling tomorrow's can release. It's been a tough decision for us today/tonight. Yes we did package the beer in cans, but after tasting many cans all night we realized that there are certain aspects of the beer that we find to be lacking in what we want from our IPAs. So we are NOT releasing it. We taste the beers throughout the brewing process and we hoped and thought that after canning it would find its stride -- which is often the case. In this case we feel it isn't where we want it to be. These IPAs we make are full of experimenting with different parameters with the larger goal of making the best IPAs that we are excited about. This was a very hard decision -- and a costly lesson for us. We’re looking to hire 1-2 enthusiastic and qualified people to join our Monkish team as tasting room servers. • Serving beer to and interacting with customers. • Educating customers on Monkish’s history, brewery, philosophy, and beers. • Bussing and assuring clean facilities and keg lines. • Organizing and stocking beer and merchandise inventory. • Working to maintain a friendly and welcoming atmosphere at Monkish. • Other customer service and tasting room related tasks as required. • Must love Monkish beers! • Previous relevant experience in a fast-paced service industry with preference to a brewery retail environment. • Exceptional communication and customer service skills. • Passion for and knowledge of beer. • Must be able to work long hours on your feet and be able to lift 50 lbs. If you are interested in applying, please email a resume and cover letter to jobs@monkishbrewing.com with the following subject title: “Tasting Room Server — (First & Last Name)”. Haiku de Saison is a lovely beer and we're excited to share it with you! It's a mixed-fermentation saison that aged in our French oak foudres (large 1400gal wine vats) with our house mixed culture of wild yeast and souring bacteria. For over 20 years these foudres aged Sauvignon Blanc; as a result this tart, earthy, complex saison has layering notes of white wine and oak. This tart saison will continue to evolve with age. This is the first beer from our foudres that we're releasing. 6.3% ABV (750ml corked & caged champagne-style bottles). Bottle Release is Sat, Nov. 7, but online presale begins Thurs, Oct 29 through eventbrite.com. Click >>HERE<< for ordering details. The beer which was brewed on Christmas Eve 2014 is a blend of two separate brett saisons: a rye-based saison and a spelt-based saison. Both were fermented with a mixed culture of saison yeast (two strains of brettanomyces, and two strains of lactobacillus) for layers of tropical fruitiness, slight tartness, and earthy funk. After it was blended we decided to dry hop it gently with Amarillo and Galaxy hops (why not?!) to accent the notes of juicy tropical fruits. so i lied about trying to update the blog more. i know that there are many out there who read this with interests in starting a brewery and/or interested about our equipment. so i probably should try to add more posts. -- in Oct 2012 we leased the adjoining unit. -- in Jan 2013 we purchased a bottle filler. -- in Jan 2013 we decided it was time to give up self-distribution. so we signed with Incline Beverages for the SoCal region. 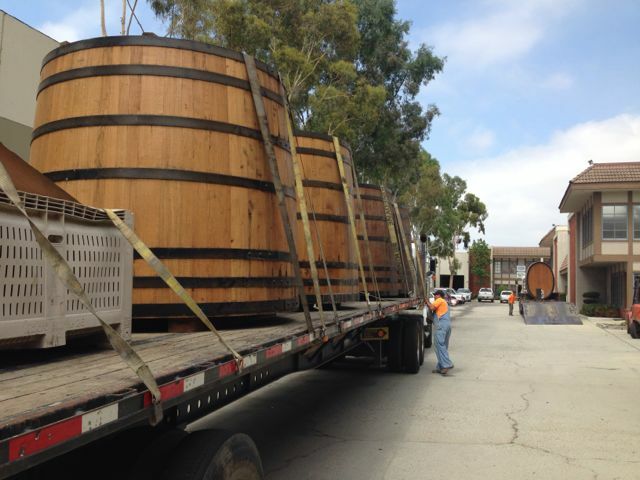 -- last month we started putting beer into oak barrels. but i have learned a lot this past year and i feel i should be jotting down thoughts and reflections and simple Monkish updates here. 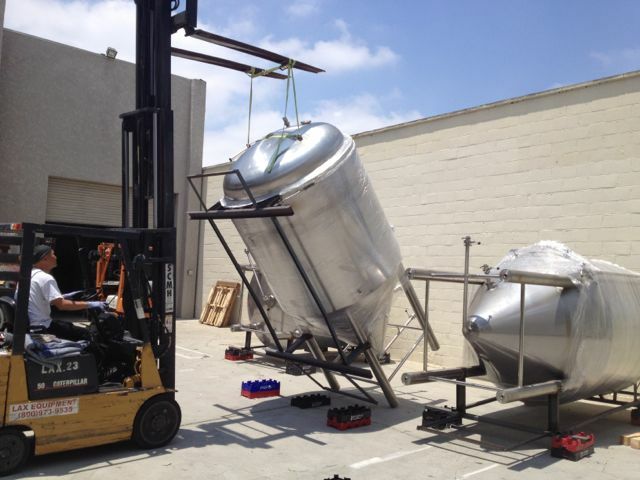 Last week we received our new fermentation and brite tanks from PBST (Pacific Brewery System Technologies). We ordered them just a few weeks ago so we are happy with the quick turn around time. 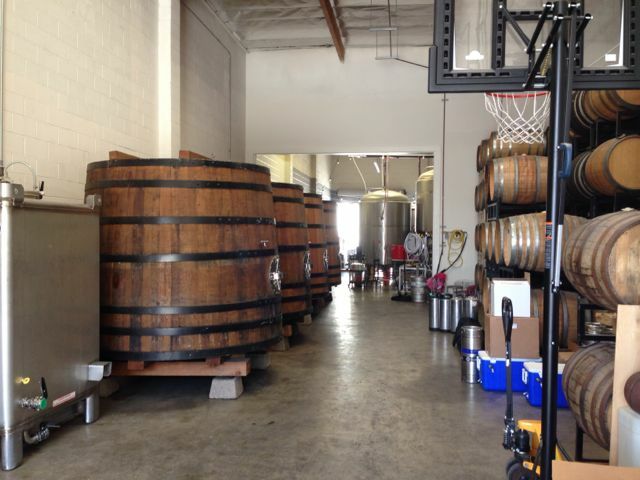 The tanks are 30-barrel tanks which are doubled the size of our initial (15 bbl) fermentation and brite tanks. This will close to tripling our production. It took just a couple of hours for my uncle and I to unload the three tanks from the 45-foot long sea container. Then we stood them up outside... removed the frames... then with the help from a couple of friends the tanks were moved inside. They are now mounted and anchored in place, and they will be soon be installed and ready for use. We have been open for about 3.5 months now. One interesting issue that has come up often is how people refer to us as MonkFISH Brewing. Hmmm... We did not name the brewery after a fish. Here is a bit about why we named it Monkish (Monk-ish). Hopefully you know what "a monk-" is. And "-ish" is a common suffix denoting that something has qualities or charateristics similar to a noun – in this case being "monk". So the brewery is interested in having qualities similar to monks. But not just any monk. We are giving a hat tip to the monks throughout Belgian beer history who have brewed beer in and sold it through a monastery. Any google search on Benedectine – in particular, Trappist – monks reveals a rich story of monks selling wonderful beers as an act of worship to God and as forms of financial sustenance and charity. 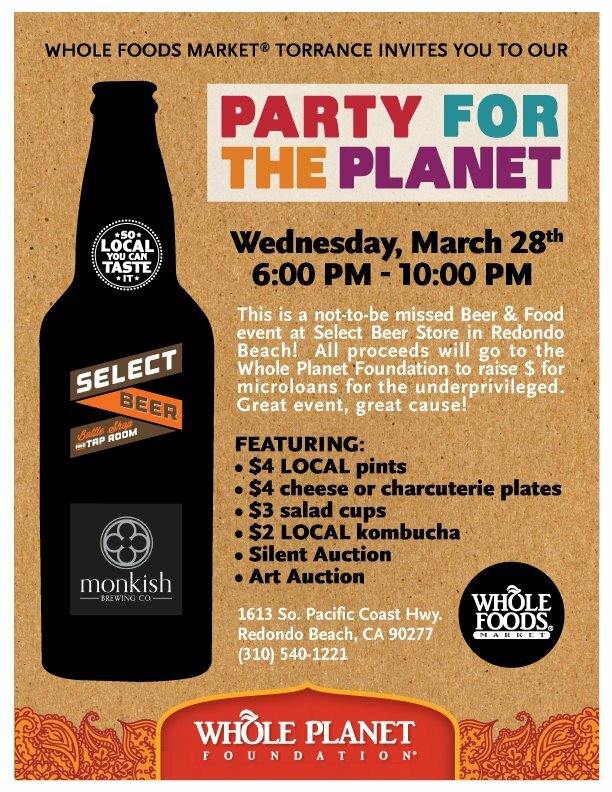 More importantly, these monks made renown beers that have inspired the direction of Monkish Brewing Co.
My wife (Adriana) and I (Henry) embrace the Christian tradition and have been involved in and worked at churches and non-profit organizations. I also have a doctorate in Theology (New Testament studies) and have taught the subject at various universities and seminaries. So since we love Belgian beers – including monastic ones – and with our faith association, we decided to name the brewery in the same vein as the rich brewing traditions of monks in Belgium. BUT... we are not Belgian... we are not monks... we are not merely copying well-known monastic beers... we are not limited to the same ingredients as such beers... Hence, we are just MONK-ISH. sorry again for the silence, but it has been a very, very, very busy few months trying to get things ready to 1) start production, and 2) opening the tasting room. we brewed our first batch on Feb. 12. and since then have brewed a total of 5 batches. batch #1 has been kegged and we have started to sell to accounts. eventually we will have consistent hours, but in the meantime, check out the "TASTING ROOM" page for a current schedule of hours. or follow us on TWITTER and FACEBOOK for updates. See you at the tasting room soon!